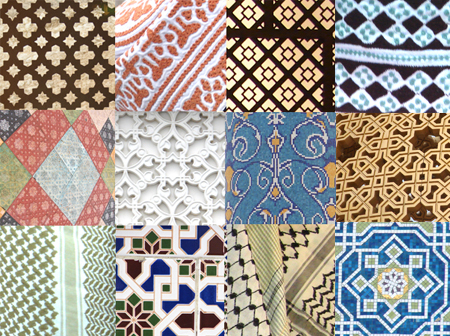 Preview of different Arabic & Arabesque Patterns from Oman. The best thing about the Arab world, is that it is a world in itself, and there is always a new place and a new sub-culture to discover within this vast Arab speaking geographic area extending from Morocco to the Gulf. My travels took me to Oman, where I was fascinated by my experience in the city of Muscat. One of the most fascinating aspects of the Visual culture that I first noticed was the beautiful patterns that one can’t miss. In Architecture, in textile, in decoration, in traditional clothing, authentic and rich Arabic and Arabesque patterns are pretty much everywhere. But there is much more to Oman than beautiful patterns: The country has some unique characters that are not typically found in the surrounding Gulf. The landscape is breathtaking and the infrastructure is excellent- making it a rising tourist destination by all means. And of course, the city of Muscat is rich its own typographic character, inviting me once again to document the typo-graphic street language of the city. A documentation which often comes helpful as a visual reference in many projects we are involved in at Tarek Atrissi Design. Collected images from the Typographic street landscape of the city of Muscat.